With today’s plethora of cable channels and streaming TV options, advertisers wanting to reach a truly mass audience have very few choices. That is why big brands are still willing to pay a massive premium to have their ad shown during the Super Bowl. With upwards of 100 million viewers in the US alone, CBS will charge advertisers an average of $5.2 million for a 30-second spot in tonight’s big game. Although extreme, the expense is worth it for advertisers who produce highly effective ads, as getting your message out to the world can have a huge impact. But producing effective ads is much harder than it seems. For every brand that nails it on Super Bowl Sunday, there are many others that don’t break through, or worse, totally flop. In 2019, advertisers have many advanced tools available to them, helping ensure their ads are hitting the mark. One such tool, the Swarm platform from Unanimous AI, has become very popular with advertisers that want to accurately predict how their audience will react to their ads. Using Swarm, marketing professionals can quickly generate AI-optimized evaluations by amplifying the insights of real consumers in real time. Studies have shown that insights generated by Swarm are significantly more accurate than traditional methodologies. To showcase the power of Swarm, Unanimous AI partnered with a major ad agency and pointed the power of the Swarm platform at this Sunday’s Super Bowl ads. The researchers chose a diverse set of 30-second spots from those available in the days leading up to the big game. In addition to optimizing the insights of regular consumers, the research team also brought groups of experts into the Swarm platform, amplifying the knowledge and wisdom of media strategists from one of the biggest ad agencies in the world. Using the Swarm platform, groups were tasked with evaluating eight 30-second spots (see list below). After viewing each spot, the groups used Swarm to answer questions inspired by Northwestern University’s Kellogg School of Management ADPLAN rating system. The ADPLAN system was designed to compare the effectiveness of ads on six criteria (Attention, Distinction, Positioning, Linkage, Amplification and Net Equity) and to give an overall letter grade. Finally, the groups used Swarms to compare the ads head-to-head and generated a ranked list. Modeled after swarms in nature, Swarm is a collaborative intelligence platform for generating AI-optimized insights from networked human groups. 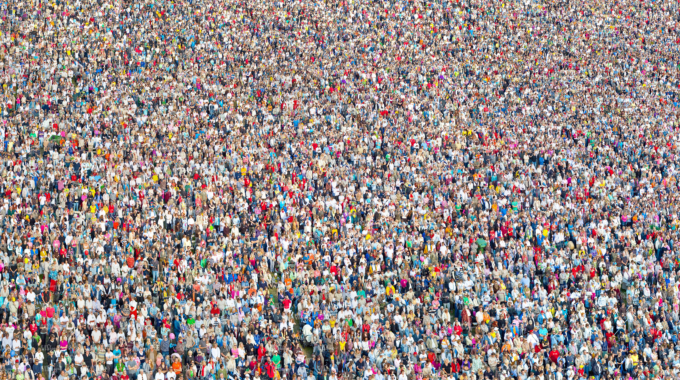 The power of Swarm is that the underlying algorithms don’t rely on how participants report their sentiments (as reporting can be unreliable and inconsistent), but instead processes how each of the participants behave when converging in real-time as part of an intelligent system. This means that populations can be asked questions that appear simple on the surface but generate very precise answers, so long as the prompts elicit complex behaviors in real-time. For example, in this study, the participants were asked to compare two ads (Doritos and Pringles). The question was posed in a very clean and simple format, asking which ad was best, and whether it was better by a little or by a lot. But, as shown below, this simple structure elicits complex behaviors and enables Swarm to generate AI-optimized results. The image on the left is a snapshot of the group responding in real-time to the question provided. Each of the magnets is controlled by one of the networked participants, their position and orientation varying over time as the group converges upon an answer. The image on the right is how the Swarm AI engine views the response of the group, evaluating their actions, reactions, and interactions. By processing these complex and authentic behaviors in real-time, the Swarm AI system is able to calculate a precise assessment of group sentiment known as the “Conviction Index”. This value can be compared across questions and across groups, providing a comprehensive set of comparative results. The higher the score, the stronger the Swarm’s conviction in its choice. Using the AI-optimized sentiments generated from each Swarm response, Ad Effectiveness Profiles were generated for each of the eight ads tested, across each of the four attributes that were assessed (Attention Getting, Brand Positioning, Likelihood of Buzz, and Message Amplification). The Aggregated Ad Profiles present the scaled Conviction Index values generated for each ad, across all four attributes, providing a quick visual representation of that ad in the attribute-space. The Segmented Attribute Profiles present the same data by ad attribute, showing how the four ads compare by AI-optimized sentiment. The Summary Chart shows all ads and all attributes in one at-a-glance view. 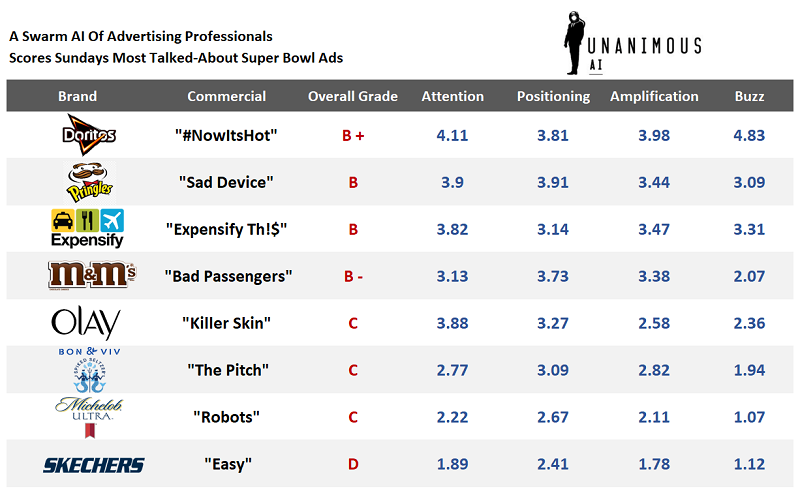 While none of the ads received an A grade, the Doritos ad got the highest overall grade, a B+. The star power of both Chance the Rapper and the Backstreet Boys clearly made an impact, as the ad was ranked highly on all attributes, plus overall. Pringles and Expensify received B grades, while M&Ms got a B-. On the other hand, despite Tony Romo’s notoriety as a former player and current broadcaster, the Skechers ad, featuring Romo, scored poorly across the board, receiving a D overall. Olay, Bon & Viv, and Michelob Ultra also failed to impress the Swarms, each receiving a grade of C.
Interested in leveraging Swarm for your business team or customer research? Read more about the Swarm platform here or request a demo.